Algomedix is developing a non-opioid, non-addictive, novel TRPA1 antagonist for the treatment of acute and chronic pain. Utilizing its novel TRP drug discovery approach and research capabilities, Algomedix is focused on the advancement of a novel, small molecule TRPA1 antagonist for the treatment of pain. This product candidate offers the potential for a next-generation analgesic devoid of the addiction and tolerance limitations affecting existing classes of drugs. The effective treatment of both chronic and acute pain is a significant health challenge. Existing treatments, including opioids and non-steroidal anti-inflammatory drugs, have significant shortcomings including safety, tolerability, abuse and addiction. 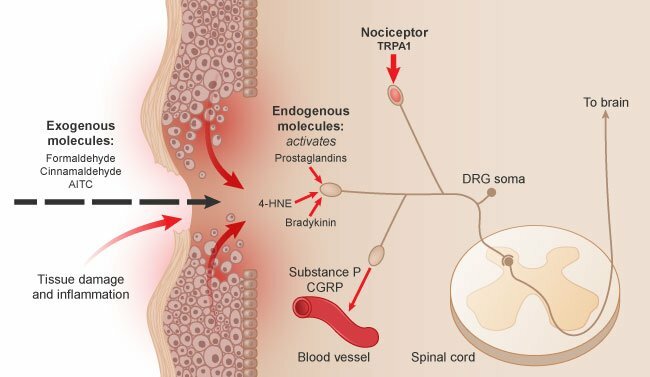 Novel TRPA1 antagonist targets the ending of sensory nerves that transmit pain in response to injury and inflammation. Algomedix’ novel TRPA1 antagonist works by blocking pain at its source in the peripheral nervous system. As illustrated below, TRPA1 is highly expressed on nociceptor nerve fiber endings – the origin of pain signaling. During the course of tissue damage and inflammation a number of different inflammatory mediators, such as prostaglandins, are produced at the site of injury. These mediators are all capable of activating TRPA1, leading to the generation of action potential in the form of a pain signal in the brain. TRPA1 functions both as a signal detector and integrator from a variety of sources. Pain fibers, including C fibers and delta fibers, have an effectory function that gives rise to an inflammatory response. Due to the selective expression of TRPA1 on C fibers, the Algomedix therapeutic is able to act directly on the periphery and thus does not need to enter the brain to be active. As such, the Algomedix therapeutic candidate is devoid of central nervous system effects and addiction potential. Algomedix’ TRPA1 antagonist offers a defined mechanism of action to block pain signaling. As seen in the illustration below, TRPA1 is activated through a receptor-operated ion channel (shown in green). When activated, TRPA1 forms a cation pore leading to the generation of pain signaling. Algomedix’ novel drug acts as an antagonist by binding to the TRPA1 receptor space and keeping it closed and preventing excitation. The nerve fiber is unable to generate action potential when TRPA1 is blocked, thus shutting down the signal that leads to pain sensation. Algomedix’ TRPA1 antagonist demonstrates preclinical efficacy in validated pain model. Algomedix has demonstrated substantial preclinical evidence supporting the ability of its TRPA1 antagonist to inhibit acute and inflammatory pain responses. These findings elucidate the target as rapid acting, reversible and acting by covalent means. This research includes demonstrated efficacy in the Chung spinal nerve ligation model for neuropathic pain. Data demonstrates that the compound has a clear dose-response relationship and is able to achieve a high level of inhibition that is also reversible. Data also indicates a low level of brain exposure and no behavioral effects.